Since our first efforts to put a Vision document together in 2008 we've heard anecdotally that the biggest issue in the Village is the parking shortage. Several factors were identified as causes but the amount of extra spaces needed to remedy the problem had not been identified. In 2010 we engaged the engineering firm of Omni Means Engineering to conduct a Parking and Circulation Study. 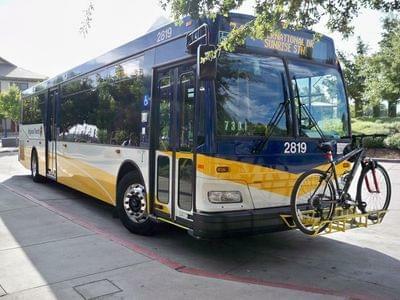 The Study concluded that the Village was short of roughly 200 parking spaces, it also validated the causes and proposed several solutions that individually addressed each aspect of the problem. Our organization is using this document as a starting point to put together a master plan to solve our parking issues. This will require collaboration from many of our community organizations as well as private citizens to agree on solutions and to acquire grants to fund the solutions. Please join us in this effort. Details being developed to do this in conjunction with parking issues to improve access and use of both the Village and RT. 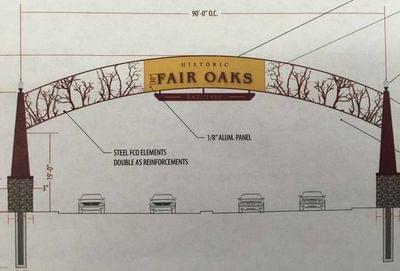 An Entrance Arch to the Fair Oaks Village over Fair Oaks Boulevard just east of Sunrise Boulevard.